TOKYO — Japan midfielder Takashi Inui was introduced by La Liga team Real Betis at the Spanish Embassy in Tokyo on Thursday after impressing at the World Cup. The 30-year-old Inui, who played for Spanish club Eibar for three seasons, said he has a three-year contract with Betis. 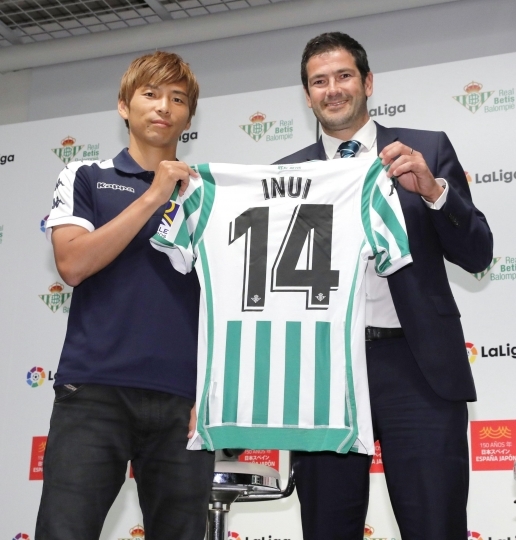 "Betis' football last season was very attractive for me," Inui said. "I had a strong feeling that I wanted to be a part of the team." Inui scored two goals for Japan at the World Cup in Russia, and played a major role in helping his team reach the last 16. Inui scored in Japan's 2-2 draw with Senegal in the group stage of the World Cup. He got a second goal in his team's 3-2 loss against Belgium in the knockout stage. Real Betis says Inui will keep the No. 14 shirt he wore for the Japanese national team.